Inline skating, like any sport that involves motion, may involve varying degrees of health risks or injures. Kuxuan recommends that all skaters wear full protective gear, including: wrist guards, elbow, knee pads, and a helmet as well as reflective devices. For your kid's safety, pleae always keep that in mind. We highly suggest choosing the size according to your kid's foot length, for size may vary among different brands. Please check the size again with our size chart before ordering. All of our products come in frustration-free packaging, which is recyclable and comes without excess packaging materials. The product inside is the same, and everything is included in this packaging that would be in the retail packaging. 1. Wiggle each wheel to check axle tightness. If bolts/screws that secure the wheels are loose, tighten them with the Allen wrench included in the box. 2. Check for laces loop and cuff buckles. 3. Wear one pair of athletic socks. 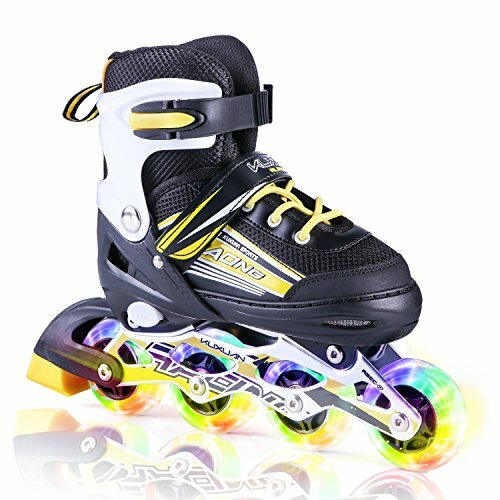 Skates should fit securely without being too tight or uncomfortable. If you have any question or problem with our products, please email us directly. We will reply and solve your problem promptly. If you have any questions about this product by Kuxuan, contact us by completing and submitting the form below. If you are looking for a specif part number, please include it with your message.